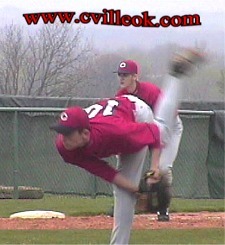 Jimmy West picked up the win in Collinsville's 7-3 victory against Coweta in day 2 of Collinsville's 4-Day tournament. I used a photo from Day 1 with Josh Compton on his knees. 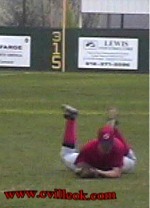 For Day 2 he is on his belly successfully diving for a foul popup. Coweta scored their 3 runs in the 5th inning. with 2 coming in this 3-photo sequence. 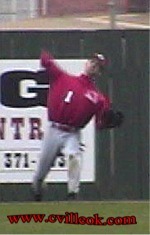 Chad Ausmus (#1) sends the ball back toward the infield. 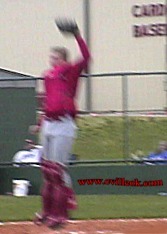 Catcher David Chester leaps high at the plate but the throw sailed to the backstop. 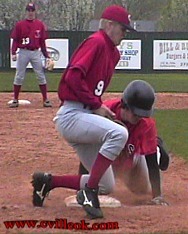 The throw back to Ricky Rimpley (#9 at third base) was too late to get the batter after two others had scored.